Who says decorating stops at the ceiling? If you ask me, the ceiling is the fifth wall in a room… and it should not, nay will not stand for being ignored anymore! 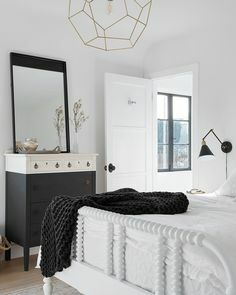 Statement ceilings are a huge trend in 2018, so I’ve rounded up some of my favorites — like the one (above) from Rue Magazine — for inspiration for simple but detailed, unique designs! Check out 21 incredible ceilings (below)! This rustic wooden beamed ceiling is the perfect recipe for setting a cozy vibe. Transforming the ceiling into an accent wall. Bravo! I love how the bookshelves mimic the design of the ceiling. This room is fun everywhere you look! Another example of using accents from the ceiling into the room, like with the bookshelves and chandelier pictured here. So COCOCOZY! The unique detail of this ceiling breaks up all the white, adding texture. This is what high white beam dreams are made of! Oh hello, dreamy kitchen! Love the paneling on this light and bright angled ceiling. Who knew tree stumps could be used for epic ceiling paneling? With its wooden beams, modern light fixtures and white, bright and airy vibe, this hallway is an absolute Y E S in my book. When rustic meets chic. This elegant bathroom features a paneled ceiling and chandelier paired with minimalist decor to create an ambiance that’s simple, sophisticated, and oh so Insta-worthy. Love the idea of utilizing the ceiling’s beams to incorporate more decor like they did here with the Fish Market sign. How incredible is this minimalist yet intricate design? Yes please. Height for days! This 19th century Art Nouveau apartment in Copenhagen houses 13-foot high walls and I just can’t get enough of the stunning painted ceilings! The ivy ceiling takes this Italian dining experience to the next level! The designers over at the Chicago Athletic hotel did a spectacular job of preserving the building (from 1893! ), while maintaining a modern-day luxury feel. This is one of my all-time favorite East Hampton kitchens! Can you even imagine it without this distinct ceiling? A love story featuring the fifth wall! Create eye-catching, but not overpowering designs by using wallpaper that covers the wall and goes over the ceiling. Everything (including the ceiling) in this Greek-island home by Isabel López-Quesada perfectly complements each other. A great example of using the beamed metal ceiling to add texture and color. The sky’s the limit when it comes to ceilings! Keep reaching for new heights! P.S. Where are other areas in your home you’re looking to make a statement? Let me know over on Instagram @cococozy!